Sound-insulated centrifugal fans. Maximum air capacity up to 16740 m³/h. 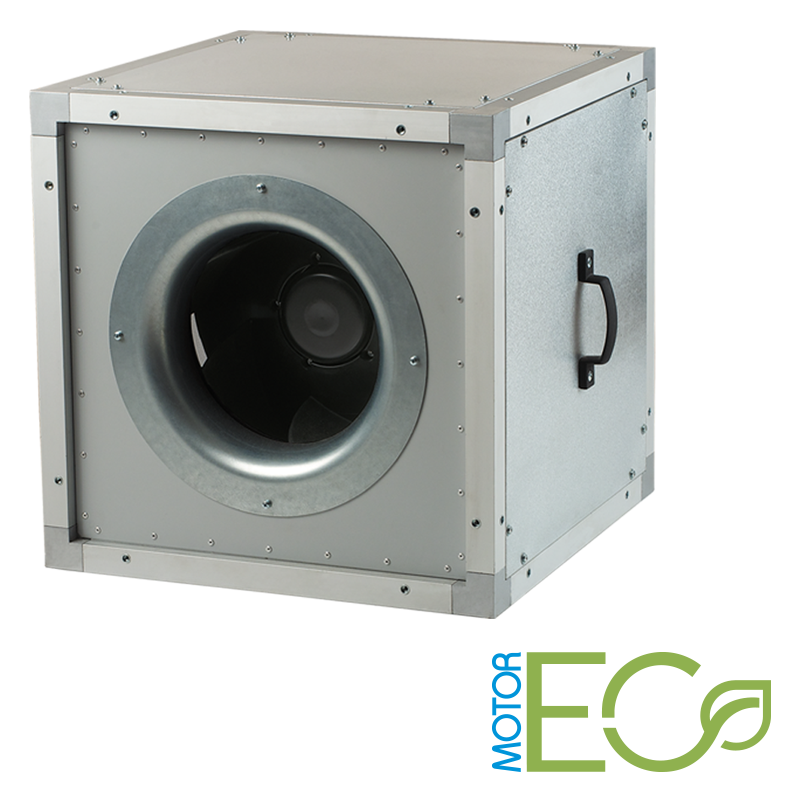 Supply and exhaust ventilation systems installed in premises with high requirements to the noise level.A perfect solution for various ventilation system configurations due to a special transformable casing design.Suitable for use as a component of a modular air handling unit.For arranging energy-saving and controllable ventilation systems.Compatible with Ø 315 up to 630 mm round air ducts or 500x500 up to 800x800 mm rectangular air ducts. Casing made of aluminium frame and removable aluzinc thermal and sound-insulated double-skinned sandwich panels.Casing internally filled with 20 mm non-flammable mineral wool.Position of the removable panels can be adjusted to inline air flow or 90° angle air flow. Due to corrosion-resistant and thermally insulated casing the fan is suitable for external use.The fan is compatible with square to square vibration absorbing connectors (AKV series) or square to round connector-reducers (ARV series), both available upon separate order.The round spigot of the ARV connector-reducer is rubber sealed for air tight connection. The fan is controlled with a 0-10 V external control signal, e.g. CDTE/0-10 speed controller for EC motors.The fan capacity is regulated by various parameters, including temperature level, pressure, smoke, etc.EC motor changes its rotation speed synchronously with the fluctuation of the control parameter to ensure the best suitable air flow.The fan is compatible with 50 and 60 Hz power mains with the same maximum speed.The parameters may be set and controlled due to data exchange between a PC and the fan.The fans can be integrated into a unified decentralized computerized network to adjust ventilation system with respect to specific user's demands. High-efficient direct current EC motor with external rotor and backward curved blades.EC technologies meet the latest requirements to arrange highefficient energy saving ventilation.Equipped with ball bearings for longer service life.Overheating protection by built-in thermal switches with automatic restart.Dynamically balanced turbine. Compatible both with square and round air ducts.Connection to air ducts through flexible vibration absorbing connectors or connector-reducers of a matching section.External terminal box for connection to power mains.Mounting in any position in compliance with the air flow direction. Maintenance space must be provided.In case of outdoor mounting the fan may be equipped with the upper protecting cover (RSD-IV series) or the outer hood (AH-IV series) to be installed at air inlet/outlet.